RUGBY LEAGUE: Chris Henderson has a passion for refereeing and is aiming to make it to Queensland Cup or NRL level by the age of 25. He played rugby league to the under-14s and then started to referee games. "I felt a bit out of my comfort zone at the start but refereeing is now my passion,” he said. In the past three seasons, he has refereed two under-12 grand finals and this year's U14 grand final in the Warwick and District Junior Rugby League. At this stage, most of his central referee appointments have been in junior rugby league. "I have done sidelines in under-18 footy in the TRL and hope to be doing central refereeing jobs next year,” he said. Some keen students of the game noticed two referees for some U18 games late this season. The year 11 student at Assumption College is a keen student of the sport and looks up to two referees, NRL pair Gerard Sutton and Matt Cecchin. Cecchin has announced his retirement at the end of this season due to abuse but Henderson already has his mind made up about what is said from the sideline. "Any criticism goes over my head, I have never changed my mind,” he said. As for dealing with players he knows, Henderson is largely refereed to as Sir. He has no problem addressing players he knows in the Warwick and District Junior Rugby League by their Christian names. Henderson has sent a couple of players off for disciplinary issues. He is completing a certificate 3 in dental assisting as a school-based apprenticeship and admits he will move to Brisbane when the need arises to further his refereeing career. "I want to be refereeing in Queensland Cup or NRL footy by the age of 25,” he said. That means he has nine years to go to achieve his ambition in the toughest spot on a rugby league field. Warwick and District Junior Rugby League president David Landers said with the right training, Henderson could go to higher levels in the sport. "There are now pathways which referees can follow,” Landers said. 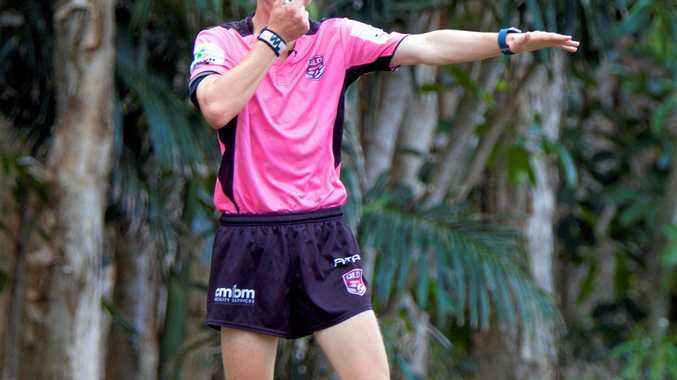 Queensland Rugby League U18 and U20 competitions are part of the pathways for refereeing. Landers said his league was also looking for more referees. "We like referees to start young,” he said. The Warwick and District Junior Rugby League will be happy to accept prospective new referees next year. Landers expects one or two refereeing seminars will be organised as a forerunner to the Warwick and District Junior Rugby League competition.